But a lot of everyday consumer items are. NEW YORK ( MainStreet) -- It's a long-running joke that virtually every item on store shelves in the U.S. is probably made in China, but as one report shows, the vast majority of goods and services sold in America are still produced domestically. Just 2.7% of the money U.S. consumers spent on goods and services last year went to products made in China, while 88.5% of that spending was on products made in the U.S., according to an analysis of import and sales data released this week by the Federal Reserve Bank of San Francisco. The vast majority of goods and services sold in America are still produced domestically, a report shows. So why does it feel like every other item you buy is made in China? As the data in the report show, if you focus on particular durable and nondurable goods such as clothing, shoes and furniture, rather than on services such as housing and medical care (which are almost entirely handled in the U.S.), the percentage that comes from China is significantly higher. One-fifth of all furniture bought by Americans last year was made in China, compared with 60% made in the U.S. In fact, some 35% of the clothing and shoes bought here were made in China, which is actually a greater share than the 25% of these items made in America. But before you start lamenting all the revenue America's businesses are losing to Chinese products, keep in mind that much of the money consumers spend on these and other Chinese goods goes to Americans. "Obviously, if a pair of sneakers made in China costs $70 in the United States, not all of that retail price goes to the Chinese manufacturer. In fact, the bulk of the retail price pays for transportation of the sneakers in the United States, rent for the store where they are sold, profits for shareholders of the U.S. retailer and the cost of marketing the sneakers," the researchers wrote. "These costs include the salaries, wages and benefits paid to the U.S. workers and managers who staff these operations." In total, more than a third of the price consumers pay for goods imported from China and other countries abroad ends up in the hands of businesses and employees based in America. 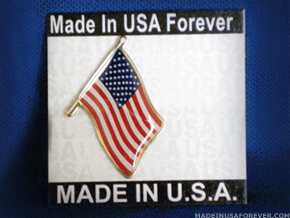 It may be made in China, but it can make money for the U.S. in the end.